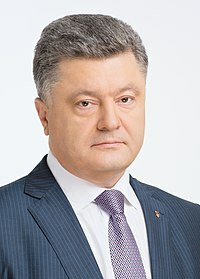 English: Petro Poroshenko, president of Ukraine since 2014. Deputy Secretary of State Bill Burns meets with key political leaders in Kyiv, Ukraine, on February 25, 2014. Meeting with presidential candidate Petro Poroshenko in Lviv, May 22. U.S. Secretary of State John Kerry and Ukrainian President-elect Petro Poroshenko shake hands after addressing reporters before a discussion that preceded Poroshenko's meeting with President Obama in Warsaw, Poland, on June 4, 2014. U.S. Secretary of State John Kerry meets with Ukrainian President Petro Poroshenko at the U.S. Department of State in Washington, D.C., on September 18, 2014. U.S. Secretary of State John Kerry listens as President Obama joins European leaders in a discussion with Ukrainian President Petro Poroshenko before the NATO Summit in Newport, Wales, on September 4, 2014. Heads of State of the Customs Union with President of Ukraine and representatives of the European Union.